"Is there any recommend FLV player for Mac? I downloaded a short flash video from YouTube and have tried a couple of free FLV players for Mac. But I can't play videos even after adding the .flv extension. Can you give me some help?" As most people know, FLV is a video file format for flash video. Flash video content may be embedded within SWF files and the audio and video data are encoded in the same manner as there are within SWF files. Originally developed by Macromedia, FLV container file format is supported in Adobe Flash player. Nowadays, FLV video format has become the dominant web video format and everyone can online watch FLV videos from sites like YouTube, Hulu, VEVO, Yahoo! Video, metacafe, Reuters.com, etc. Of course, people also can offline view FLV videos via the third-party programs for Windows or Mac users. However, FLV player for Mac app is much more difficult to find comparing with Windows FLV file player. But don't be discouraged and just keep on reading. Note: It is better that you can figure out and download the proper free FLV player for Mac to stream flash videos on your Mac computer. If not, it is wise for you to turn to FLV converter Mac- MacX Video Converter Pro. It is feature of painlessly converting FLV to MP4, MOV, M4V, etc. video formats on Mac OS X (Yosemite/El Capitan included) with original quality. Later, users can freely playback the converted FLV videos on Mac computers (iMac with Retina 5K display, MacBook Pro/Air, etc). It is generally believed that Wimpy Player is one of the best FLV players because it is compatible with various tablets, phones and PCs (Mac and PC). Supported playlists for Wimpy Player includes JSON, XML, RSS, Text and more. In addition, its special Skin Machine allows you to freely design a skin that matches your unique taste. And when you want to play .flv video file, you just need open Wimpy Player and directly drag video to player's interface. Serving as a new powerful free music & video player, 5KPlayer can be used to successfully play 4K/5K/8KUHD FLV videos on Mac and PC, even play 360 degree VR video. It is worth mentioning that this free FLV player for Mac also enables you to free download HD or UHD FLV videos from online video sharing sites like YouTube, Dailymotion, Vimeo, Vevo, Facebook and More. Obviously, this all-in-one FLV video downloader and player can meet all your needs of offline viewing FLV videos. Perhaps most of people used this functional FLV video player to replay flash videos before. Certainly, there are still many people applying VLC Media Player today. As a bright spot of VLC, it can be well installed on Windows, Mac and Linux operating system. In addition to FLV, VLC player is capable of reading lots of other video formats like playback HEVC, 3GP, ASF, AVI, OGG, QuickTime file format , Raw DV, MXF, VOB, RM, DVD-Video and so on. Some people once said, "You can't miss Elmedia Player, if you are trying to download FLV player for Mac." Why Elmedia Player is so remarkable? Actually, as a multifunctional free media player for Mac, Elmedia Player supports a lot of audio & video formats, for instance, FLV, SWF, WMV, AVI, MOV, MP4, MP3, DAT, FLAC, M4V, MPG, MKV and more. Almost it can stream all media files on your Mac. Although above top 4 Mac FLV players are all easy to use, a majority of people still favor the default media player for Mac – QuickTime. Unfortunately, QuickTime can't directly decode FLV multimedia container format. To put it in another way, in order to smoothly replay FLV video files on Mac, users should install some additional software to make QuickTime available. Sounds like very complex and confusing? Don't worry. In fact, you can simply convert FLV to MP4, MOV, M4V or even common AVI, MPEG, etc video formats compatible with QuickTime or other media players. For easily converting FLV to Mac, here, we introduce you an extraordinary FLV converter Mac: MacX Video Converter Pro. This video converter for Mac El Capitan can help viewers freely convert FLV to MOV, MP4, M4V, MP3, etc. that QuickTime can play. 83X faster speed and no quality loss. Better still, it also can work as a FLV Video downloader which lets you free download online videos from YouTube and another 300+ video sharing sites like Dailymotion, Vimeo, Vevo, BBC, Facebook, etc for offline playback on your Mac iPhone iPad and Android devices without restriction. Now, follow the below step-by-step guide to convert FLV to MP4. 1Free download FLV video converter Mac, run it, and then import source video by clicking "Add File" button. 2Select the output format. 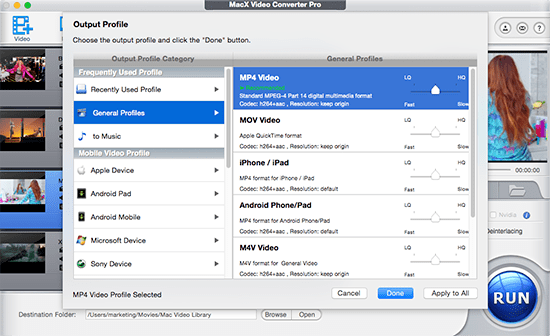 In the output format area, you are suggested to choose QuickTime supported video formats, such as MOV, MP4, etc. 3Click "Browse" button to select a destination folder to save your converted video.